West Bengal Police Notification is out. West Bengal Police is recruiting for 8419 Male Constable Govt Job Posts. You can check West Bengal Police - West Bengal Police last date, download West Bengal Police notification, visit West Bengal Police official website and check other West Bengal Police Vacancy details.Complete Vacancy and recruitment Details about 8419 Male Constable Govt Job vacancies in West Bengal Police are provided below by JobSarkari.Com only for you. Last Date for Apply Online. 05/03/2019. Last Date for Application Fee Payment. 05/03/2019. Mode of Payment Application fees Can be Submitted through Internet Banking, Credit Card, Debit Card, e-Wallets, Bharat QR, UPI App or UBI Challan. Total No. of Post 8419. Male Constable Candidate Must Have Passed 10th Class from West Bengal Board of Secondary Education. Age Relaxation OBC 03 Years and SC / ST 05 Years For West Bengal Candidates Only. 2. Physical Measurement Test (PMT). 3. Physical Efficiency Test (PET). Candidates Need to Qualify 1600 meters Running within 06 minutes 30 seconds. 2. Candidate Have to Click on the Apply Online Link Given on Our Website in Important Link Section. 3. Register Before Applying for the Post Already Registered Candidate Does Not Need to Register Again. 4. After Successful Registration System Will Generate a Login ID and Password to Proceed. 5. Login With ID and Password and Fill the Application Form Carefully Read all the Instruction before filling the form. 6. Candidate Need to Upload the Scanned Copy of Documents in the Prescribed Size and Format as Mention in the Application form. 7. Candidate Need to Take the Printout of Your Application form for Future Reference. 8. Online Application can be Submitted on or Before 05th March 2019. Q. 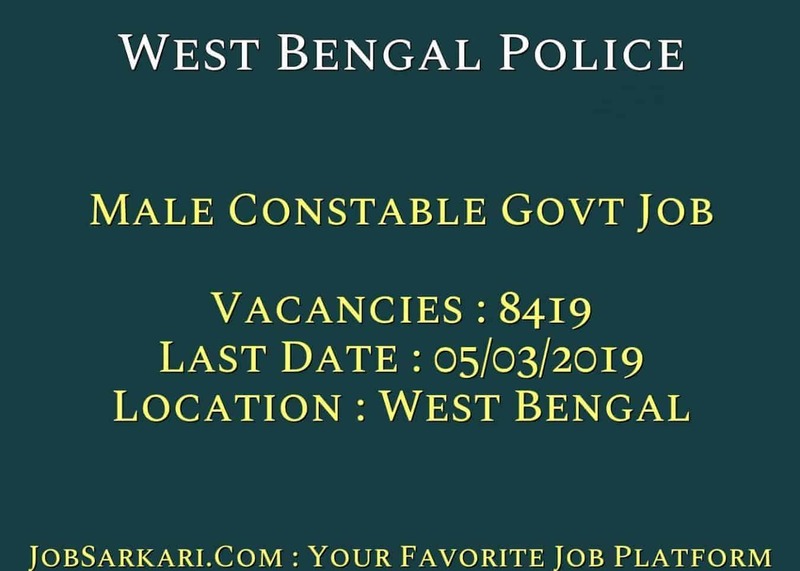 What is the Last Date For West Bengal Police Male Constable Govt Job Vacancy ? A. 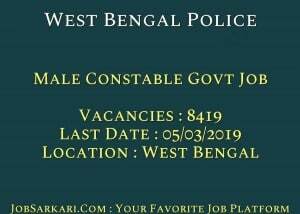 Last Date for West Bengal Police Male Constable Govt Job Posts is 05/03/2019. Q. What is the Form Type of West Bengal Police Male Constable Govt Job Recruitment ? A. The Form Type for West Bengal Police Male Constable Govt Job Posts is Online. Q. How many vacancies are available in West Bengal Police Male Constable Govt Job Posts ? A. There are about 8419 Vacancies in West Bengal Police Male Constable Govt Job Posts. Q. What is the Full Form of West Bengal Police ? A. Full Form of West Bengal Police is West Bengal Police . Sir Himachal Pradesh se apply kr skte hai? Nahi aap Apply nhi kr Sakte Hain..